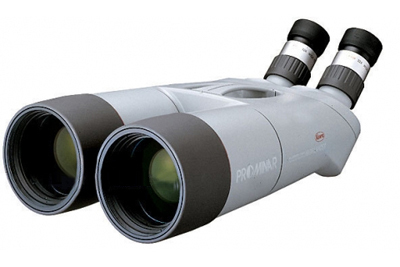 Ideal for long-distance wildlife and marine glassing or wide-field comet-hunting and detailed Lunar observations, Kowa's 32x82 Standard High Lander Angled-Viewing Binocular is equipped with water and fogproof optical tubes, wide-angle 32x power eyepieces and over-sized objectives to give you the ability to observe terrestrial and celestial subjects 24/7/365 in any weather conditions. Fully multi-coated optics improve light transmission to produce high-contrast views that are bright and clear with accurate color fidelity. Individually-focusable eyepieces enable highly-precise focusing capability so most users will be able to use them without the need for corrective eyewear. The eyepieces are set at a 45° angle to the optical tubes to place them in a comfortable viewing position whether you're sitting or standing; and to help overcome the common issue with finding subjects through an angled-viewing optic, Kowa designed a convenient sight-line along the top of the chassis. The eyepiece orientation, large objectives, and high magnification make the High Lander a challenge to hand-hold, so dual 1/4"-20 and 3/8"-16 mounts are integrated into the bottom of the binocular for easy use with most field, photo, and video tripods to give you a stable platform. 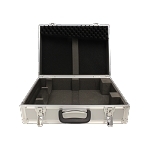 An integrated handle helps to set-up and break-down the binocular safely. 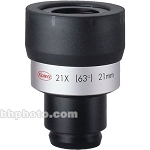 Standard 32x wide angle eyepieces are included. Additional eyepieces are sold separately.